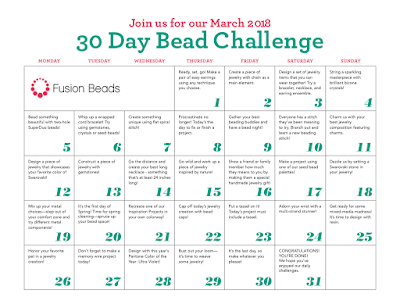 Before the popularity of shopping for beads on the internet became mainstream, if you wanted beads, you either had to order from a print catalogue, go to a local bead store, or attend a trade show. Believe it or not, there used to be bead shows every weekend (sometimes more than one show would happen at the same time). I used to help my family at Green Girl Studios and traveled the country from coast to coast doing shows for them. One of my favorite shows to do was in Hawaii and we would go a few times a year. It was perhaps one of my favorites because not only was it set in a tropical paradise, but the people. I met so many amazing, kind, generous, sweet people. (I'm lucky to still keep in touch with some of them!) We made the show a family trip and have a lot of lovely shared memories. The other day I got a little "homesick" for Hawaii. We had over ten inches of snow here in Pennsylvania and I just wasn't feeling it. 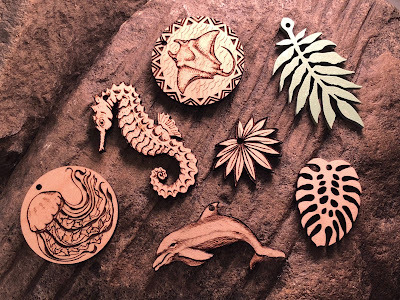 Instead of getting dragged down into the blues for sunshine and the sound of the ocean, I designed a collection of Hawaii-inspired components. We used our new laser to create them. I'm lucky to have my creativity as a way of channeling my feelings into something positive and productive. I'm really happy with how they turned out! If you happen to be in southwestern Pennsylvania, you can get a little taste of Hawaii at Allegory Gallery in Ligonier. 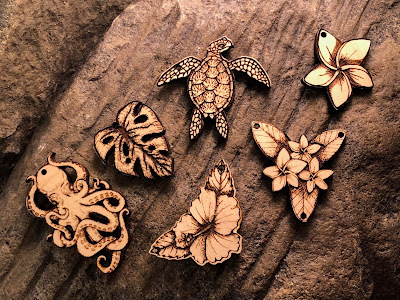 If you're fortunate enough to be in Oahu, you'll soon be able to find these pieces at The Bead Gallery! 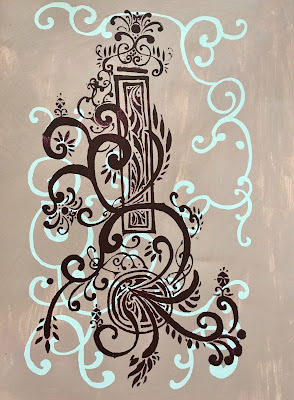 And if you can't make it to either, you can always swing by the Allegory Gallery Etsy page. CLICK HERE to visit the Etsy shop. Last year, we had an art exhibition at Allegory Gallery called, "The Art of the Bead". The aim of the show was to showcase the diverse approach to bead-making and feature the pieces as works of small-scale artwork. Really, what are beads but small little sculptures that we wear? We had 50 different artists participating from around the world. 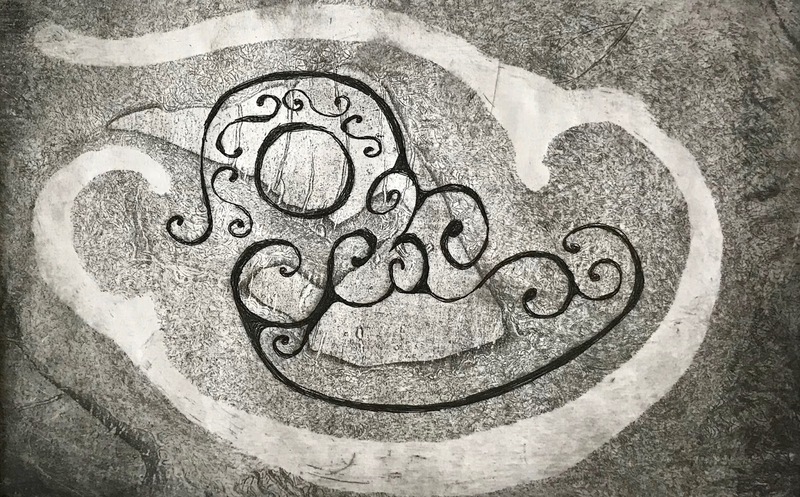 The artists represented a wide range of different techniques and materials. Back in November, there was a pop-up exhibition called, "Into the Forest" organized by Julie Takes, Emily Squires Levine, and Laura Tabakman. The show was in a gallery space in Pittsburgh and featured the work of polymer clay artists from around the world. They also had a guest speaker during the opening named Brigitte Martin. Brigitte Martin is a goldsmith and the founder and editor of Crafthaus. During her presentation, she talked about how we can elevate polymer clay and further the artistic dialogue about polymer clay as an art medium. And it got me thinking... how can I help the conversation? And it dawned on me that I have a unique position as a gallery owner and creative director to use my influence and put my stamp of approval and say, "this is art". In the grand scheme of things, I don't know really how much my "stamp of approval" is worth, but I still wanted to do my part. So, we decided to do a follow-up exhibition that focused on polymer clay as the primary medium. We asked 13 different artists to participate. 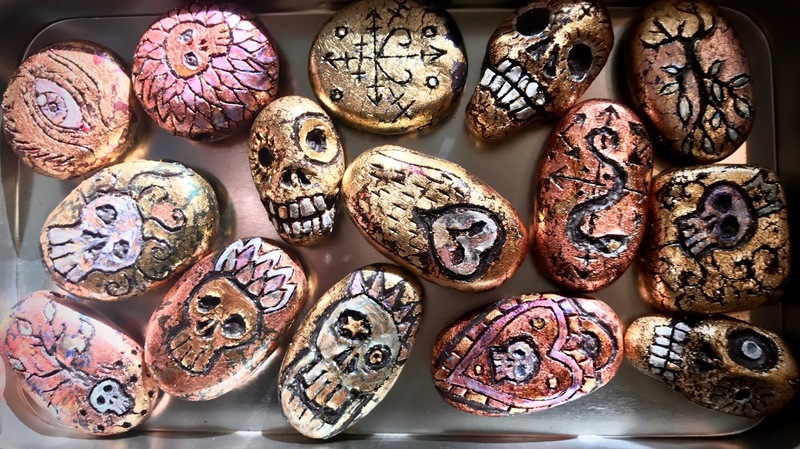 Instead of having each artist show just one bead, they created a collection of 12 beads. This multiplied the beads of exhibit threefold! We wanted each artist to have the opportunity to show a range of their work and represent their point of view as polymer clay bead artists. 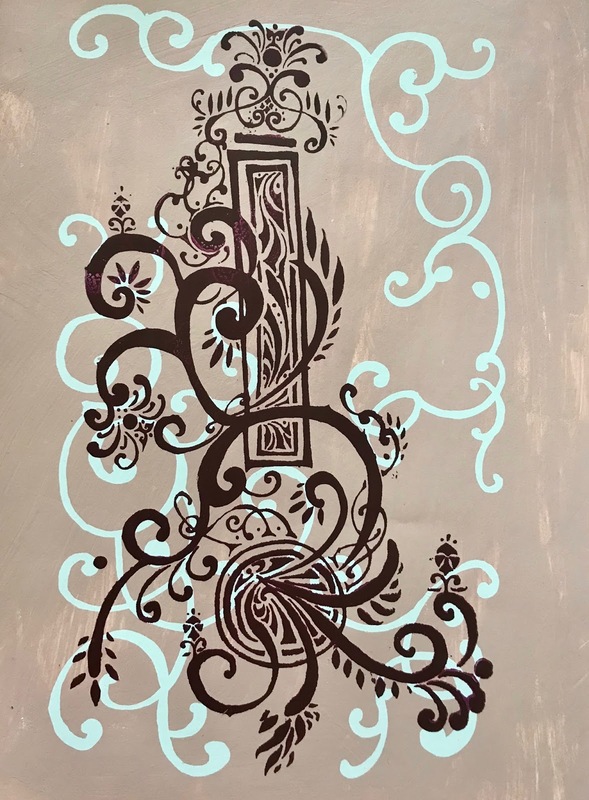 The show features the work of Christi Friesen, Pamela Wynn, Ann Marie Donovan, Terri Powell (aka Artsy Sciencey), Brooke Bock, Erin Prais-Hintz, Heather Powers, Jenny Davies-Reazor, Kelly Russell, Rebecca Watkins, Wendy Wallin Malinow, and me! The show will be up until May 18th, so if you're in the Ligonier area, you should definitely stop by and see the collection in person! If you can't make it to Southwestern Pennsylvania, you can see all of the amazing submissions, CLICK HERE. I've long been fascinated with reliquaries. 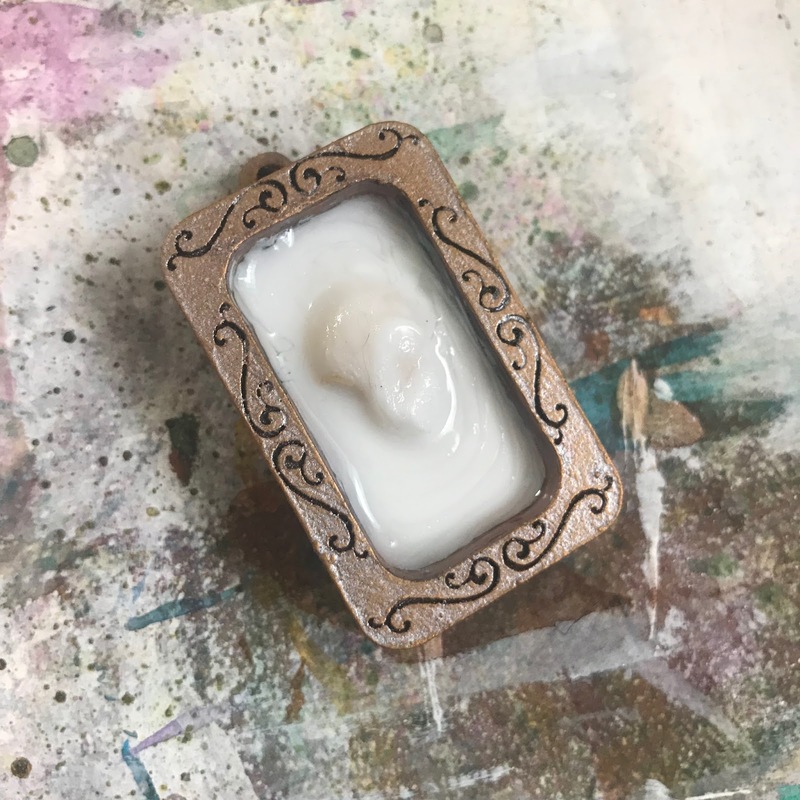 There's something about the veneration that happens when something... whether a little finger bone or an ordinary object... is placed in a frame. It's a declaration. It says, "THIS IS SPECIAL!" 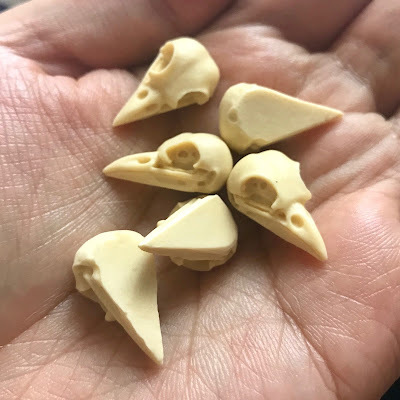 A few years ago, I ordered these miniature cast resin raven skulls from Europe. They've been languishing in a box in my studio for far too long. I wanted to actually use them and I thought that this was the perfect opportunity! 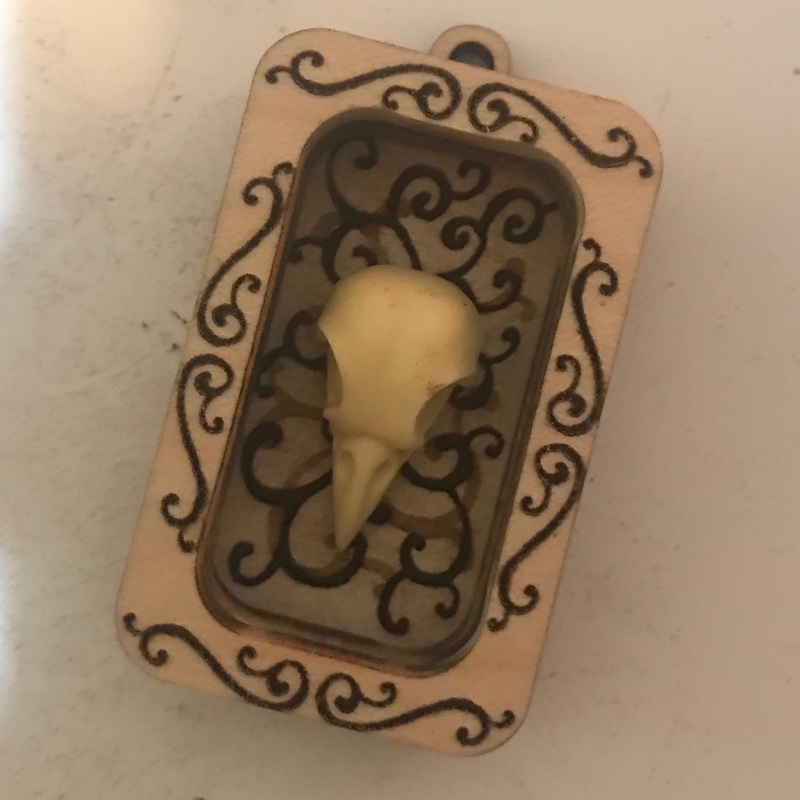 To capture the raven skulls, I took my drawings and transformed them into a pendant frame, layer by layer. Once I had all the pieces fitted together, I painted them and played with various surface treatments. (Though I kind of dig the natural wood look. 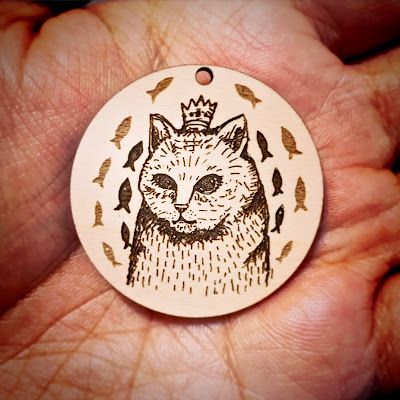 But maybe it's just because I'm smitten with the look of laser-engraved wood right now.) 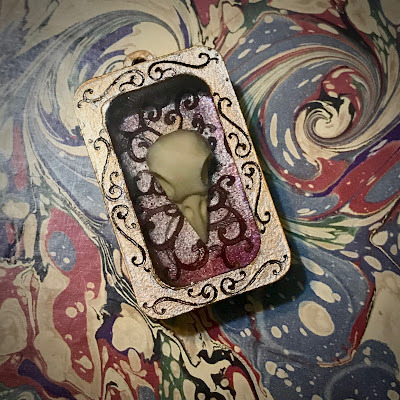 Then... once I had the finished frame, I adhered the skull and then poured resin. 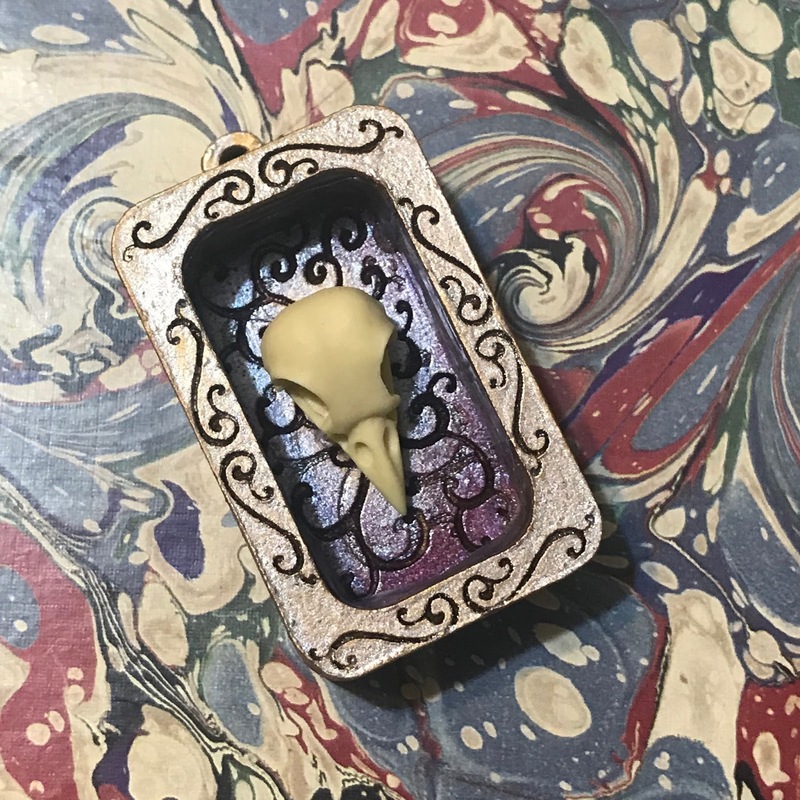 In hindsight, the resin has its pros and cons. In the pros category is that it has a watery, optical feel. It also protects the little skull. (Though since it is recessed, it's pretty safe! But if I wanted to, I could rivet on a piece of mica and channel my inner Daniel Essig. If you don't know his work, you should check it out! CLICK HERE to take a gander.) In the cons section, it deadens some of the effects I worked to achieve with the surface treatments AND since the skulls have a lot of negative space, air bubbles can get trapped easily and often. 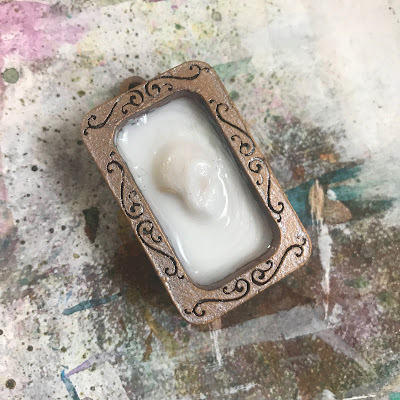 Also in the cons column is that if you're tired and not paying super close attention, you can mix up the opaque resin with the clear resin and you end up with a highly venerated blob. At least it's a SPECIAL blob! Normally folks share all their glorious triumphs, but sort of gloss over their mess ups. But in an endeavor to be real... here's photographic evidence that it's not all rainbows and kittens in Studio Thornton. Luckily with the new laser, my mess (which in the privacy of my studio is pronounced with an "f" and ends with an "uck" sound) ups aren't quite as earth-shattering, as I can make another in short-order. 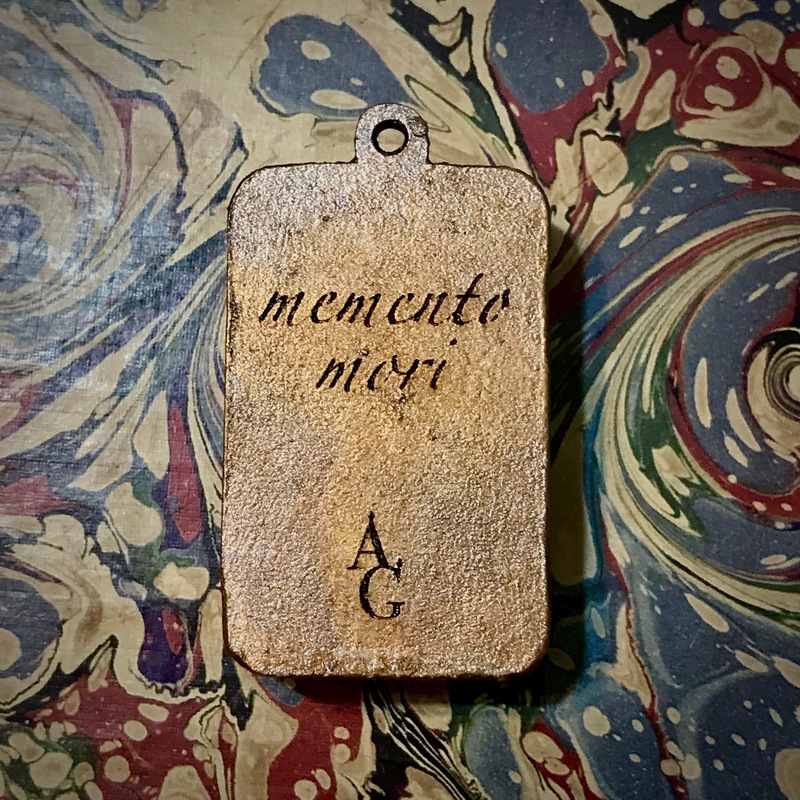 To finish it all off, I laser-engraved the words, "memento mori" on the back. It means, "remember death". But really, it means remember LIFE!! Live life each day to its fullest and try always to learn more and do more and be more. Death is also not the end. When the Death card is drawn in tarot, it sometimes is a welcome card. It symbolizes the end of one phase and the beginning of another. It's a harbinger of transformation and change. It embodies letting go... and flying free. I think I'll hold on to this little gem for myself. 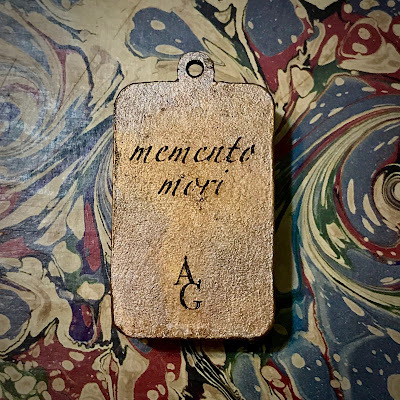 But if you're interested in one, contact Allegory Gallery via EMAIL or convo us through Etsy and make sure to specify that you're curious about acquiring a Memento Mori Pendant and I might be able to whip one up for you. A few years ago, I had a realization. I realized that I couldn't keep the pace up that I was going at. All-nighters and forgetting to eat from being distracted by my work and constantly being plugged into the internet, answering questions at all hours of the day and night was starting to take a toll on me. The most scary thing was when I started to notice that my vision wasn't as good and that my hands were hurting more and more. Granted, I think my sight is still pretty good and my hands aren't that bad if I take care of them. But still. I realized that I couldn't keep things going as is. The trickiest thing is that I enjoy my work. I am happy to stay up all night and immerse myself in what I call the, "Deeper Well". If I'm enjoying the project that I'm working on, I will push through achey hands and a stiff back. I can be a little obsessive. But there came a point where I was constantly sick and I was emotionally drained and not enjoying it so much anymore. I was spread thin. William forced me to go to bed and he took away my devices, so I couldn't pretend to sleep, but actually work, and we had a conversation. Basically, we talked about ways that I could take the burden off of me and prolong not only my life, but my career as a maker. At that point, we were just spitballing ideas and that path ahead was still foggy. But then things started changing. I did a lot of research and tried to figure out what was actually doable. We tossed around so many different ideas. We knew that we wanted to take the burden off my hands, so we spent a great deal of time looking into ways of replicating my work and maintain the integrity. One of the things that I've been intrigued by is prints. In college, I did a lot of work with printmaking. I worked with artists like Gunars Prande, Charles Yoder, and Dominick Rapone. And it really changed my way of working. There was something magical about multiples and it was a gateway to working in collage. 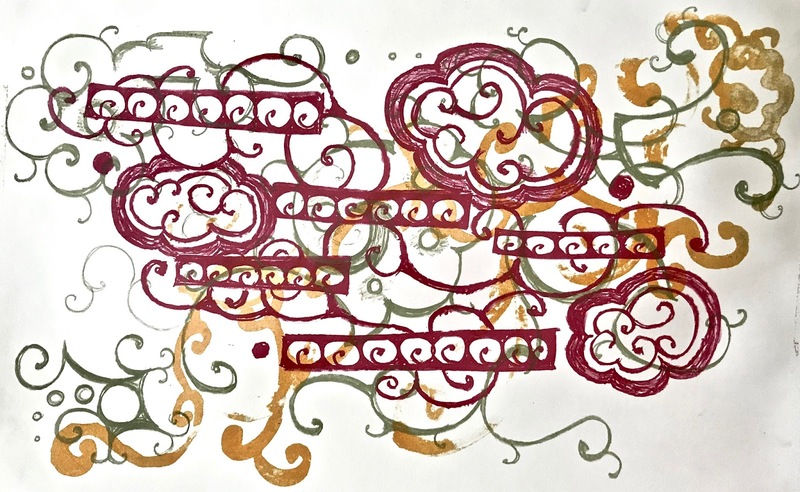 The thing about printmaking is that it's actually quite a lot of work and is very demanding. I used to call my classes my Tae Bo workout, particularly when we were working with lithography. 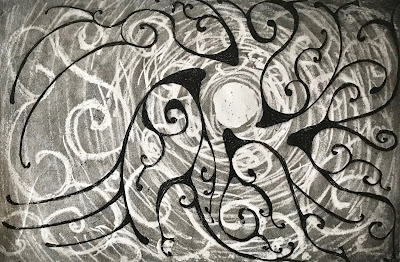 One of the thing that I enjoyed the most about printmaking (particularly intaglio printing), which is something that is hardly ever seen, are the plates. 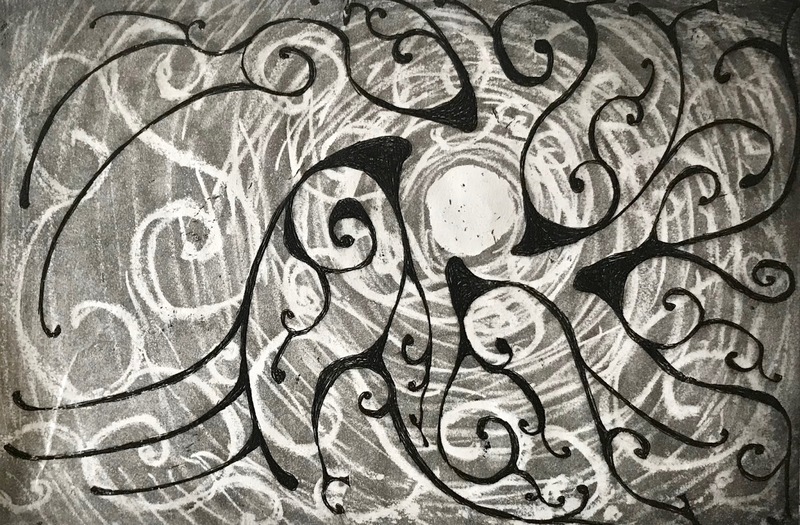 I loved running my fingers over the etched plates and feeling the subtle textures. 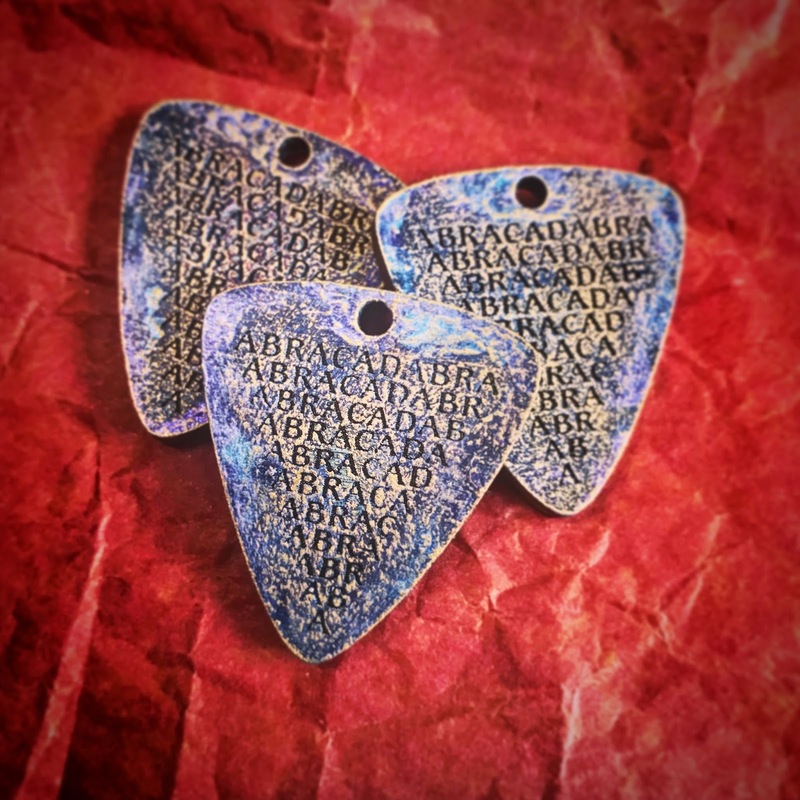 Etched metal is a beautiful thing, but I didn't want to work in just metal. So, the idea of a laser came to mind. I liked the idea of a laser, but the ones we looked at were cost prohibitive to say the least and actually quite complicated to operate. But then, as we continued our investigations, we found a new one that met our needs. It wasn't in production then and we would have to wait for it to be built. We also found a generous investor who helped make it possible. A lot has happened in the three years since we made the decision to get the laser. We moved into town and William quit his full-time job. We are now homeowners and are planning on opening another store. And now, after three years... we have our laser! 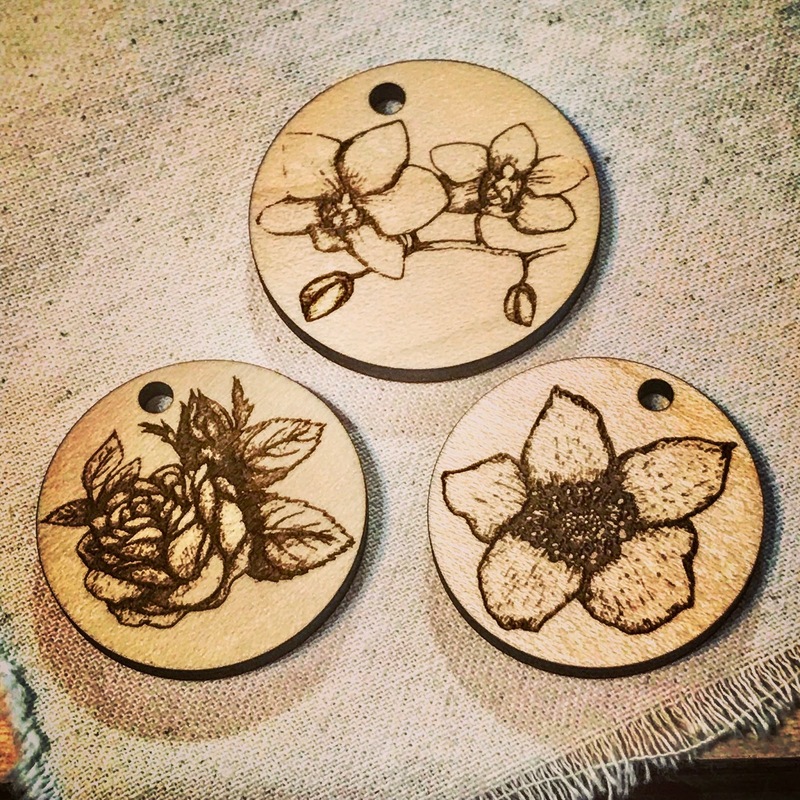 Here are some of our first pieces that we made with the laser. We took some of the Strange Botany pieces that I made for a little zine and used those botanical images for the first pieces. We wanted to test the capabilities (and still are) of the laser to see what kind of line-weights and shadowing we could achieve. I'm quite taken with how they turned out. 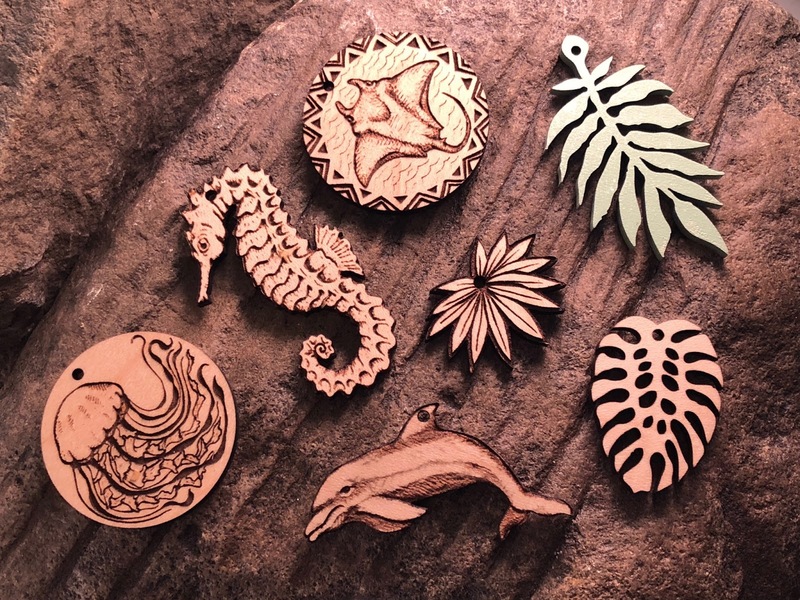 When we decided on getting the laser, I didn't want to make it just a tool to make multiples and work out the issues of production... but as a new medium that could help me connect to my 2-D artwork and to expand my current ways of making things. I'm always curious how something will push my creativity and open new doors. I really love the sepia tone look of the laser-engraved wood, but I also have a little bit of a love affair with color and surface treatments. So with these Abracadabra pendants, I experimented with different ways to alter the surface of the laser-engraved wood and add a little bit more of the artist's hand back into the pieces. All of the pieces are available in-store at Allegory Gallery in Ligonier, PA. But if you can't make it out to Southwestern Pennsylvania, we'll be adding them to our Etsy shop as we can. CLICK HERE to visit our Etsy shop. 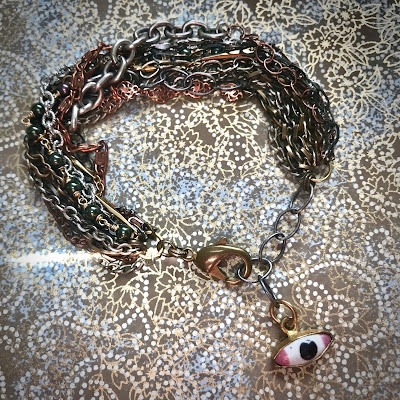 Chain bracelet by Andrew Thornton. I don't know about you, but I have a little container filled with all kinds of bits and pieces of chain that I've collected over the years. I hate to throw anything away that might be useful one day. Between samples from chain companies, to leftovers on the roll, or jewelry that I've taken apart, the chain box is brimming. (Allegory Gallery also sells mixed lot baggies filled with assorted vintage chain.) This little stash is surprisingly useful! Sometimes I'll need a jump ring made out of a particular metal with a specific patina and these chain remnants can be cannibalized to yield up the perfect match. And sometimes you just need an inch or two for an extender chain and my little collection always delivers. I added an extender chain so that it can be adjusted according to wrist size. I also used a larger size chain for this purpose and a larger brass lobster claw clasp so that in theory it can be clipped onto the end of another chain to transform it into a necklace! I like pieces with versatility. And because I needed a little bit of something to jazz up this bracelet, I dangled a little bezel-set eye charm from the extender chain. It adds a lot of movement when worn as a bracelet and it actually hangs correctly when the bracelet plays Transformers and morphs into a necklace. There's still time to jump in and play along! CLICK HERE for the full calendar in PDF form. And really... I know it's fun to post things each day matching up with the prompts, but really who is to say you couldn't hop around the calendar if that's what moves you and your nonlinear sensibilities? Personally, I think the set timeline is helpful to establish a helpful baseline, but really these challenges are just supposed to be fun and are about personal growth. If you do make anything, I'd love to see! So comment with your creations. One of the things that I always look forward to this time of year is National Craft Month! 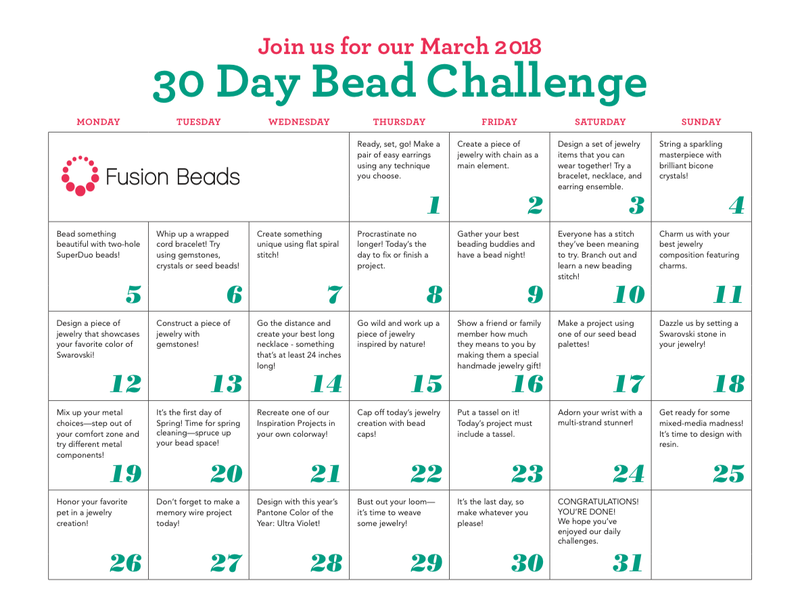 To celebrate, Fusion Beads holds an annual Bead Challenge. Even though I'm crazy busy, I always try to squeeze it in, because I always grow so much from the challenges and I really enjoy participating in them. I'm not always successful in getting everything done, but I try and usually I get a majority of the daily projects completed. For the first day of the challenge, we were encouraged to create a simple pair of earrings. 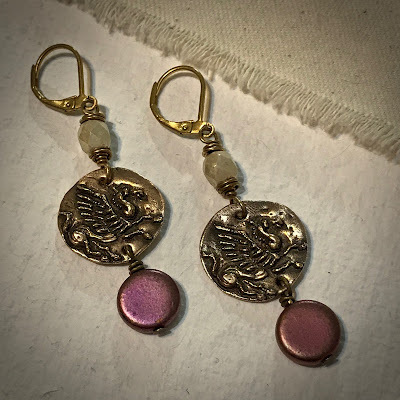 I had these pegasus bronze charms that I made hanging out in the studio. They're based off of ancient Greek coins. I've been wanting to do something with them, but hadn't found the right project. I thought this would be perfect for them! So, I double drilled them out, and added Czech glass dangles and Czech glass wire-wraps. I paired them with some vintage lever-back earwires. Presto! Day One is complete! If you want to play along, you can certainly try to challenge yourself with the the whole month or just pick and chose prompts you can fit into your schedule. Also, I think the most important part is to have fun! Don't get stressed out about it! Try to enjoy the acts of crafting and have a ball! If you'd like to find out more, including downloading the calendar of projects, CLICK HERE.